Finding great options for both casual and dressy occasions without added layers can be a challenge, especially when you’ve had a mastectomy. Camisoles, in general, are great wardrobe staples because they can be worn under a garment such as a sweater, blouse, etc. for warmth, protection, and comfort. A well designed mastectomy camisole with lace trim and some spandex is wonderful to wear under a jacket for day or evening wear. Lots of women wear them on their own with jeans together with a casual sweater for evening when the weather chills off. A mastectomy camisole provides fashion as well as great coverup with different necklines to choose from, built in bras to hold a prosethesis, and similar support as a bra. Some also serve as compression camisoles for those who develop torso lymphedema and require graduated compression rather than simply comfort spandex. Lymphedema is a side effect of cancer surgery. It most often affect women who have breast cancer, but can also impact people who have had neck and/or throat surgeries as well as prostate or abdominal surgeries. Whenever lymph nodes are taken out, there is the potential for developing lymphedema. Lymphedema happens when the lymph flow is compromised due to lymph nodes being removed. The bodies lymph system gets overloaded in this area (much like a commuter traffic jam when one or more lanes are closed). This creates swelling in the affected limb and/or torso. One of the means of managing lymphedema is through bandaging done initially by a qualified lymphedema specialist. During the day, a compression sleeve is worn which is relatively easy to manage. For the night, many bandage their limb. To make this easier, there is a system that uses a inner sleeve and an outer lycra sleeve to apply the compression. My suggestion is be aware of the prevention tips so you don’t get lymphedema in the first place. It is a chronic condition with no cure. However, sometimes with the best of care, it will happen. When it does, there are many options for managing lymphedema. After a mastectomy, choices for undergarments take a new turn. Some women have opted for breast reconstruction to eliminate this issue. However, there are many women who choose not to go that route and therefore look for functional but attractive mastectomy camisoles and bras . One mastectomy camisole that is very useful and a welcome addition to any wardrobe is a black shaper camisole. This camisole is not only designed to accommodate a prosthesis, it also has compression for those who develop torso lymphedema. Do not confuse this garment with SpanX which has compression, but not the graduated compression required for torso lymphedema. A bonus is the trimming effect on the midriff. Often when undergoing treatment, women gain weight, especially around the middle, so something that will make us look and feel trim for special occasions boosts self esteem. Having just returned from Hawaii, I want to share the issues surrounding the care needed to reduce the risk of lymphedema when travelling by air. If you have had breast cancer, whether recent or a long time ago, you may not be aware that it is wise to wear a prevention compression sleeve when travelling by air. Here is an excerpt from a position paper ‘Air Travel and Lymphedema’ distributed by The National Lymphedema Network. Wearing the compression sleeve not only supports your arm while in the air, it serves as a physical reminder to take care when lifting and handling luggage. The compression sleeve also alerts others to your situation and many offer help with the heavy lifting. It pays to be careful and take precautions to reduce the risk of getting lymphedema. Once you have lymphedema, it is a chronic issue which you will need to manage for life. Complex Decongestive Therapy (CDT) was developed to treat more serious cases of lymphedema not caused by infection. CDT consists of several treatment methods including: manual lymphatic drainage; bandaging; proper skin care and diet; compression garments; remedial exercises; self-manual lymphatic drainage and bandaging; and continuation of preventative methods throughout treatment. Seeking out treatment early on can lead to a shorter course of therapy. While most of the CDT methods are clear, many patients have questions about Manual Lymph Drainage (MLD). The procedure involves a specific type of massage that moves built up fluid around the blocked vessel, across the chest to where the lymphatic system is intact. After a 60 to 90 minute session, the area is bandaged to keep the limb from getting congested. Following a completed course of MLD treatments, a patient needs to wear a lymphedema sleeve every day. Every six months or so, a patient should be measured for a new sleeve, to ensure a proper fit. Those who have lymphedema are familiar with the basic lymphedema sleeve – natural color or black. Most wear the lymphedema or compression sleeve for function – to keep the lymph fluid moving through their arm to reduce the swelling. This compression sleeve needs to be worn all the time for most and especially when exercising. There are now compression sleeves with some ‘chic’ factor. They are fun, easy to wear (same compression but lighter weight with less bunching at the elbow), have wicking capacity and can add substantially to an outfit. No longer just a practical necessity, you can have a wardrobe of sleeves to suit your fancy and still get all the benefits that wearing a compression sleeve offers. Following surgery (mastectomy or lumpectomy), it’s important to take proper precautions to reduce the amount of discomfort and swelling that may follow post surgery. Purchasing a new bra is high on the list of steps to reduce the risk of swelling and increase your overall comfort. Depending on your surgery, your doctor may recommend that you wear a compression bra. A compression bra has a padded front zipper closure for ease of getting on and off when you arm is sore, adjustable hook-and-eye shoulder straps to ensure a proper fit and a latex-free fabric that pulls moisture away from the body and dissipates heat buildup. The bra also has a soft compression band that encircles the torso gently, has attachments to easily manage the draining tubes, and delivers comfort for the surrounding skin and muscle tissue. Patients who are susceptible to lymphedema are often told to wear a compression bra. To determine what bra size you are you’ll want to measure your chest directly under your breasts and around your back, thus determining band size. To determine cup size you’ll want to measure the fullest part of the larger breast from the midpoint of your chest, over the larger breast, and to the center of your back. Multiply the number by two. Then check the manufacturers sizing charts for your correct size. Lymphedema being a lifetime side effect of cancer treatment means wearing a compression sleeve daily and also nightly for some depending on the severity of the condition. The usual compression sleeve comes in fleshtones to make the sleeve less obvious or a sophisticated black. 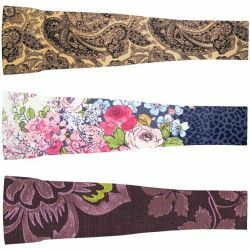 More recently, a fashion compression sleeve has been designed to add a lighthearted feel to a serious condition. These sleeves add a chic option to everyday wear or special occasions. Or they are just fun! The LympheDiva sleeves are lighter in weight without losing compression, have a smooth surface so sleeves on tops don’t ride up, and are more comfortable in the elbow area as they don’t bind. Matching gauntlets round out the look. 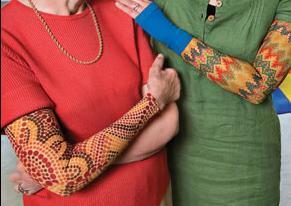 If you have lymphedema, this stylish lymphedema sleeve will give you some fresh options. Women who have lymphedema or have had lymph nodes removed as a result of breast cancer treatment need to wear compression sleeves when flying. The outside pressure when flying fluctuates wildly and can cause inefficient lymph flow. Inefficient flow can lead to fluid build up and swelling. Another reason wearing compression sleeves is imperative is the fact that flying is a sedentary activity. Limited muscle movement also diminishes lymph flow. Overexertion, such as lifting heavy bags, after sitting for so long can cause an inflammatory response, again leading to swelling. In addition to wearing compression sleeves, try to do subtle stretches and seat exercises to increase lymph flow and decrease the likelihood of blood clots forming.